Retired NBA star Jason Kidd is getting ready to start his new gig as the head coach for the Milwaukee Bucks and he’s just listed his Hamptons home in Water Mill, N. Y. for $7.995 million. 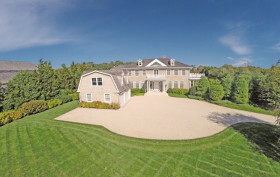 Located at 100 Flying Point Road, the four building luxury compound is just one mile from the beaches of South Hampton and Watermill. While he’s keeping his Brooklyn apartment known for its off the hook amenities (and currently available for rent), the Hamptons home is up for permanent grabs.